Beautytiptoday.com: Ulta 65-Piece Makeup Chest For Less Than $20! Wow! Ulta 65-Piece Makeup Chest For Less Than $20! Wow! For less than $20, you can receive 65 beauty tips!! That's quite a makeup chest. And it comes to you, courtesy of ULTA.com. Only $19.99 after the $5 off coupon at http://www.ulta.com/. A $195. value. If you love playing around with makeup and like to choose from dozens of different colors and makeup items, this ULTA 65-piece blockbuster makeup chest is definitely for you!! 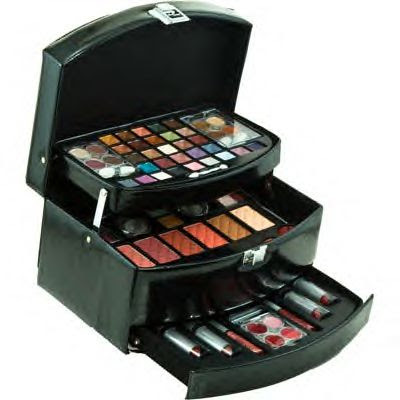 and more beauty stuff all neatly tucked away in a 3-tier patent leatherette makeup chest. (choose from colors black, pink or white). ULTA beauty stores are located in most states across the country. But if you're not close to one, their website is packed with tons of delicious beauty products. And ULTA puts out their own quality makeup, too. Unfortunately, we don't have access to an ULTA beauty store where we live---we have to drive one state over to find it, at least an hour and a half away. Same with Vice Presidential candidate Sarah Palin. Alaska isn't home to an ULTA store, either. Maybe that's why the RNC or Republican National Committee has just released figures on what it has spent so far, to keep 44-year-old Gov. Palin looking glamorous on the campaign trail. According to the latest numbers, the RNC has dished out more than $150,000 on clothes and accessories for Gov. Palin and her family. Apparently, sources say she was a drab dresser prior to being surprise selected by Republican Presidential Candidate John McCain in late August. Who cares, she looks polished and stylish wherever she travels now. The RNC spent $4,716.49 on Gov. Palin's hair and makeup through September. No wonder we noticed shiny, caramel hairlights through Sarah Palin's hair. And her makeup is really quite pretty and very well done for a professional woman on the go. Nothing is overdone, but you do notice she wears makeup, which is really okay and actually, quite refreshing. You can be both smart and attractive. Our point being----it's okay to be high-maintenance, especially if you're running for the 2nd highest position in the country. Maybe a little Botox and/or Restylane injected here and there?! Gov. Palin appears to have firm, clear skin. We aren't trying to be political in the least here, and we aren't suggesting any skin treatments, either. Presidential candidates' wives Michelle Obama and Cindy McCain also set the right tone in the numerous campaign appearances they attend. They, too, always look neat and pretty with makeup nicely done. We're not sure if these 3 women all have makeup artists, but whatever they are doing, they all look glam but approachable. Too much make-up for me! If I had a roommie I would share it with her. Why so many eyeshadows is what's got me bewildered? !